According to your time and abilities you are most welcome to ask about joining any of these organisations and events in the parish. Up to date details of meetings can be found in the weekly bulletin page - click on the top right link above. Any young person who has made his or her first communion and comes to Mass weekly is welcome to become a server. Servers help in the celebration of the Mass by assisting the priest. The main Sunday Mass is sung as are Masses on Holy Days of Obligation, thanks in large part to the work of our organist and singers. Rehearsals are usually on a Thursday evening. There are readers who proclaim the word of God and lead the prayers of the faithful at Mass. Every first Friday of the month (except January, July and August) and on all Lent Fridays except Good Friday we meet in St Anne's hall to share good company and good food in aid of a good cause. 12.30pm onwards. During the 9.00am Mass the younger members of the congregation receive teaching approriate to their ages while the adults remain in church. Children return to take part in the offertory and the rest of Mass. Every year we prepare children and adults in separate groups according to need for the sacraments or to become Catholics. First Holy Communion for children usually happens in June with classes beginning before the previous Christmas. Adults who wish to become Catholics are usually received into the Church at Easter, after a programme of preparation that begins in early autumn. Anyone who is interested in knowing more is encouraged to come to Mass to see what Catholics do. Please speak to the priest. The sick are an important part of parish life. The priest and Ministers of the Eucharist will take Holy Communion to those who cannot come to Mass. This lay-led prayer group seeks the intercession of Our Lady for the sick and suffering, the dying and the dead, the world and the Church at its meeting once a month at St Joseph's, last Monday of the month at 7.00pm. Once a month, a group of ladies from the parish meets to socialise, raise funds for charity or the parish, go out to a show, learn a new skill or generally enjoy themselves. They welcome new members. Every year there are opportunites to go on pilgrimage to Our Lady's shrines at Walsingham in Norfolk and to Lourdes in France. Every other year there are also opportunitues to go to holy places further afield. In recent years we have been to Rome (for St Peter and St Paul), Assisi (St Francis), Padua (St Anthony), Subiaco (St Benedict), Nettuno (St Maria Gorretti) and Fatima (Our Lady). In October 2013 there is a pilgrimage to the Holy Land, in the footsteps of Jersus, Mary and Joseph. See the "Forthcoming Events" page (link at the top of this page). The parish has a representive for this diocesan charity which seeks to help fund the training of seminarians for the priesthood. 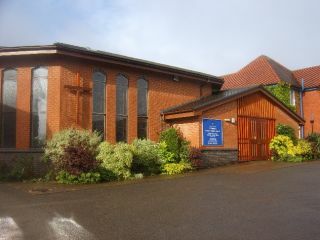 The parish school is situated fifteen minutes' walk from the church. Its details on Warwickshire County Council's site are here. Catholic children in year 3 or above whose parents wish it and commit themselves to coming to Mass are prepared for First Holy Communion in the parish and not during school lesson time. Catholic children in years 5 and 6 are prepared for Confirmation, again in the parish and not in school time. Headteacher: Mrs A Goodeve, St Anne's Catholic Primary School, Camp Hill Drive, Nuneaton, Warwickshire CV10 0JX. Other occasional social, fund raising and spiritual events happen from time to time. For forthcoming social and fundraising events, follow the link at the top of the page and also the link to the weekly bulletin.